I doubt if any other family was ever so favored by God as theirs was—a surprising thing, when one reflects on the unlawful manner in which the family fortune was, so to speak, rooted and planted in the ground with murder and bloodshed. The Macedonian was the second longest reigning dynasty in Byzantine history. However, time after time Macedonian rule was punctuated by the tenures of individuals who associated themselves with the dynasty through marriage. This might be considered "dynastic grafting," with the interlopers attempting to use the legitimacy of the Macedonian dynasty to advance their own family ambitions. The longevity of the dynasty and the degree to which usurpers and interlopers were forced to retain the legitimate Macedonian rulers (rather than simply remove them) are surprising considering its inauspicious beginnings. Basil I was an unlikely candidate to found an imperial dynasty. Born a peasant in Thrace or Macedonia between ca. 830-36, Basil moved to Constantinople where he became a groom. He was soon noticed by the emperor Michael III and moved over to the imperial household. Michael forced Basil to divorce his wife and marry the Michael's mistress. In the future this act would cause disputes over the parentage of Basil's sons. In 866 Basil murdered the power behind the throne, Bardas, the uncle of Michael III, and was raised to the rank of co-emperor. The next year Basil murdered Michael and became sole emperor. Basil's family ruled for 194 years. The Macedonian period is seen as the golden age of the Byzantine Empire. Culturally, the age is referred to as the Macedonian Renaissance; art, literature, and architecture flourished. In the realm of politics Byzantium lost its last holdings in Sicily, but in the course of the tenth and early eleventh centuries built up a commanding position in southern Italy, recovered Crete and Cyprus, pushed the eastern boundary deep in Armenia, recovered Cilicia and large areas of northern Syria and Mesopotamia, and conquered the Bulgarian Empire, restoring the Danube frontier for the first time since the seventh century. Basil II, Basil I's great-great grandson, ruled an empire that was the undisputed superpower of the day. Family issues plagued the Macedonians throughout their tenure on the imperial throne. Basil I was unsure of the parentage of his second and third sons Leo and Stephen, and even went so far as to have Stephen castrated. Basil's elder son Constantine died in 879, and the old emperor had grown suspicious of his second son Leo. Nevertheless when Basil died, after being dragged by a deer for sixteen miles during a hunting trip, it was Leo who succeeded him. The family difficulties of Leo VI (886-912) were of a different nature; he was unable to father a son and heir. Leo married four times in an attempt to bear a son, causing the Moechian Controversy within the Church. Leo's son, Constantine, was born to his mistress Zoe Karbonopsina in 905. Leo hurriedly married his mistress to legitemize his son, who was crowned at the age of two in 908. When Leo died in 912 his younger brother Alexander (912-913) became the senior emperor. Alexander had no children and continued to depict himself alongside his nephew Constantine VII on his seals. After one design where he is shown alone, Basil I's seals depict him with his son Constantine. 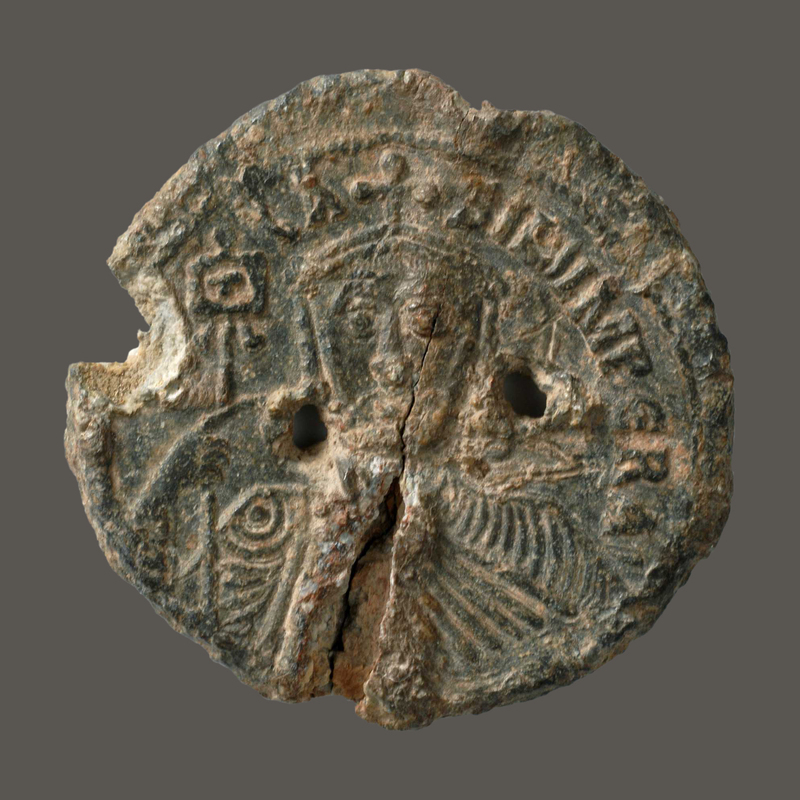 This double-portrait seal is the first to depict the emperors holding a device (a labarum or a cross) between them since Justinian II and Tiberios at the beginning of the eighth century. This design would recur throughout the Macedonian period. The last time that an emperor had chosen to show his son and heir on a seal was during the reign of Nikephoros I at the beginning of the century. It is probably no accident that these two usurpers were careful to show the dynastic continuity and stability that their reign promised. In 870 Basil added his second son Leo on his seals. Both Leo, Alexander, and Zoe Karbonopsina retained the two-emperor pattern: Leo was shown alongside his brother Alexander, Alexander shared his seals with Leo's son Constantine, and Zoe, as regent, was also depicted next to Constantine. Displaying the promise of family and continuity under the Macedonians would have been just as important to the childless Leo and Alexander and to the underage Constantine and his regent mother as it had been to the usurper Basil. After seven years Zoe's regency was replaced by the government of Romanos I Lekapenos (920-944). Although an interloper, Romanos was very careful to highlight his links to the legitimate dynasty. Before his coronation in 920 Romanos had already married his daughter to Constantine VII. Romanos I always included Constantine on his seals. Initially these took the same form as those of Basil I with his sons Leo and Alexander. After the death of his eldest son Christopher, Romanos used the two-emperor type with himself in the senior position opposite the Macedonian Constantine. Later Romanos returned to the three-emperor design, although with himself depicted in a natural style that was very different from that used for Constantine VII and his son. The design program, while explicitly advancing Romanos and his family's interests ahead of Constantine's, nevertheless acknowledged that legitimacy was acquired through association with the Macedonian dynasty. The association could be minimized, but not obliterated. 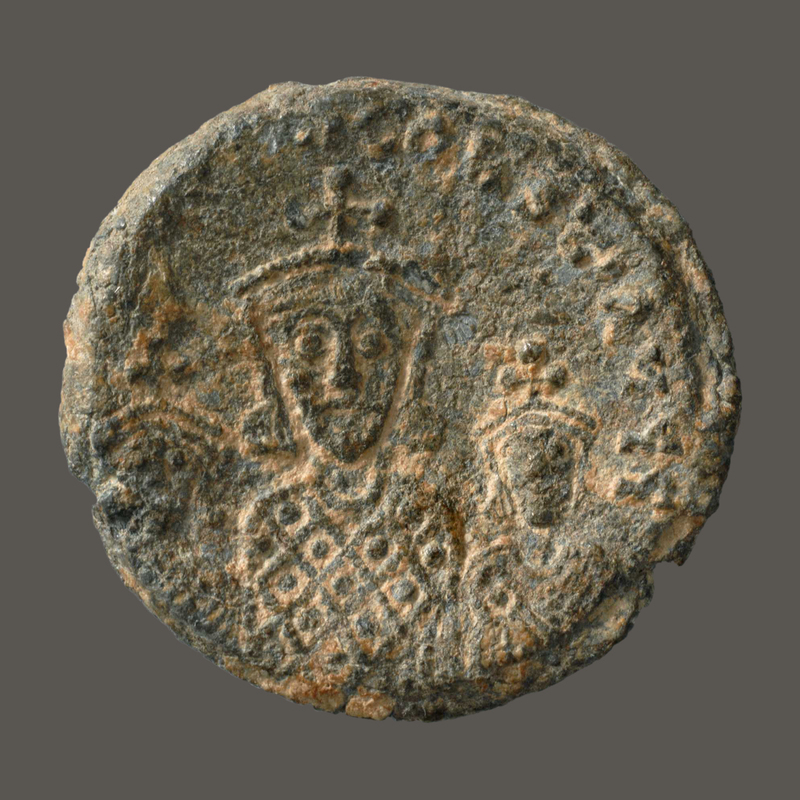 After becoming sole emperor in 945, Constantine VII chose not to share many of his seals-a decision that was duplicated by the next interloper, John I Tzimiskes (969-976), and by Constantine's grandson Basil II (976-1025) on half of his seals. Basil ruled alongside his younger brother Constantine VIII, and the other half of the seals issued between 976 and 1025 show both emperors in the traditional Macedonian stance. The emperors after Basil II were members of the Macedonian family by marriage or adoption. Romanos III married Zoe, daughter of Constantine VIII. On his death Zoe married Michael IV, brother to the powerful John the Orphanotrophos. Following Michael's death John was able to keep the throne in his family's control, albeit briefly, by having his nephew Michael V adopted by Zoe and crowned. Michael V was ousted when he turned on the empress, and Zoe married Constantine IX Monomachos. After the deaths of Zoe and Constantine, Theodora, the younger daughter of Constantine VIII, ruled alone, choosing Michael VI to succeed her on her deathbed. These emperors through marriage, adoption, or appointment used different visual programs on their seals. Only the reigning emperor is depicted, contrasting sharply with the seals of the earliest Macedonians and the usurper Romanos.